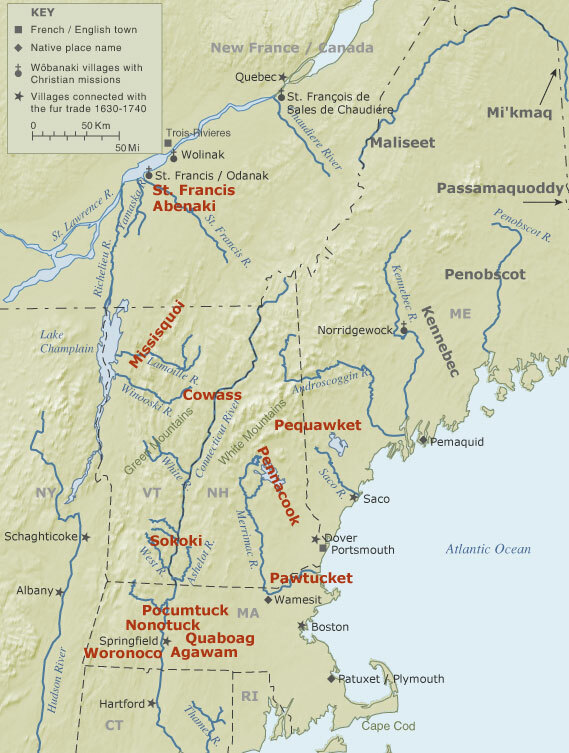 The original Wôbanaki homelands include present-day Maine, New Hampshire, Vermont, northern Massachusetts, parts of southern Canada and the Maritimes. The names in large letters are those of the different Native peoples who are generally included in the term Wôbanakiak, which means "people of the East" or "dawnland people." The easternmost of these (indicated in gray)—the Penobscot, Maliseet, Passamaquoddy and Mi'kmaq—did not participate in the raid on Deerfield. Sources: Dawnland Encounters, The Western Abenakis of Vermont 1600-1800, by Colin Calloway; After King Philip's War; by Gordon Day; In Search of New England's Native Past; by Bruce Trigger, ed. ; Handbook of North American Indians, Vol. 15: Northeast; and information from advisors to this website.